Cathcart’s mural exhibition at BOJUart Gallery is a great example of the growing artistic scene in Virginia Beach’s ViBe Creative District. 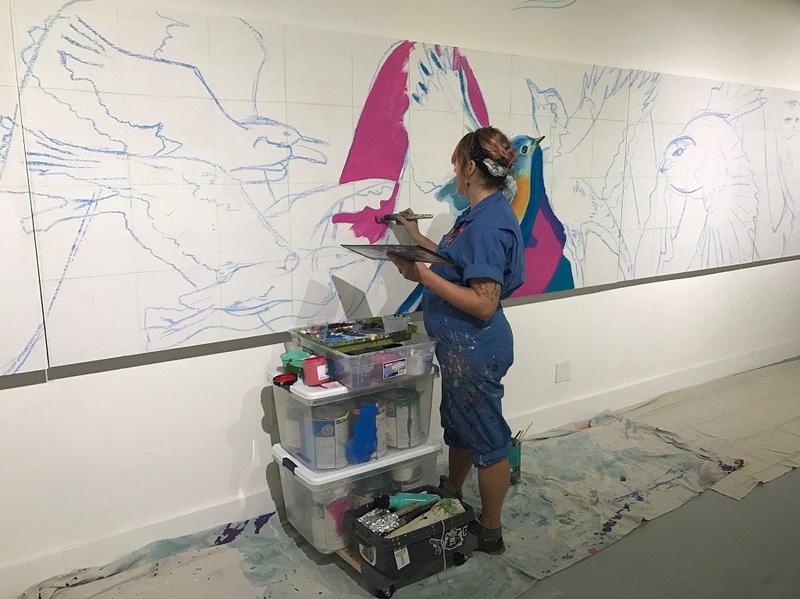 It’s the first First Friday of 2019 in Virginia Beach’s ViBe Creative District, and Nico Cathcart is beginning her live mural; a 25-ft long stretch of wood, located in the main room of BOJUart Gallery. On it, outlines of birds: halcyon kingfishers, eastern bluebirds, a Gray Jay — an aide-memoire to her previous life in Canada. Cathcart will be painting the mural as a live exhibit spanning the next four weeks, but not just because she finds birds totally super cool. Cathcart is in the process of becoming deaf. The hairs of her cochlea are slowly balding through a process of tone-based, degenerative hearing loss. She wears hearing aids which helps her hold conversations and listen to some of her old favorite songs, but her condition affects both volume and tone. An avid birdwatcher, Cathcart first took notice of her condition when birds in the woods bordering her home began to go silent. “I first started noticing when I was missing words,” she said. “But really, the birds I noticed, because my trips to the woods started to go silent. I can’t hear cicadas, birds, crickets — normal stuff along the James. I realized this was gone, and I can’t get that back.” Currently at 30% hearing capacity, Cathcart fully understands that, one day soon, her hearing will stop, its remnants relegated to memory. 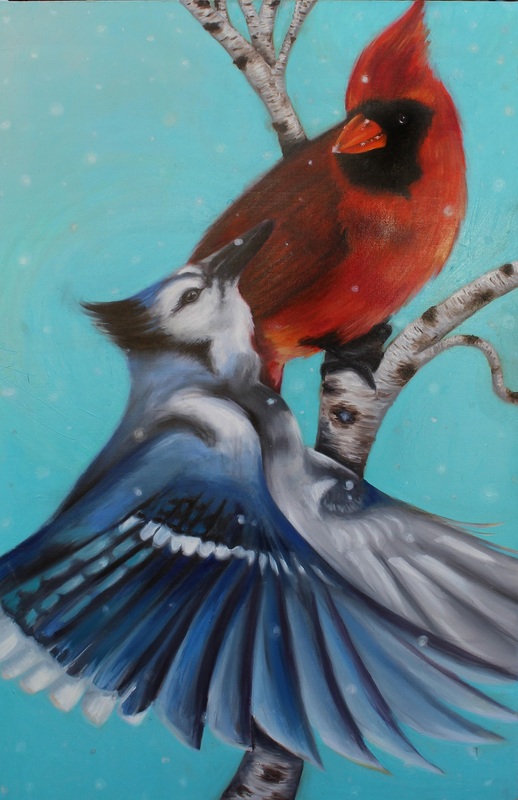 Her work has since been a myriad of bird paintings, most oil, pencil, and gouache-based. 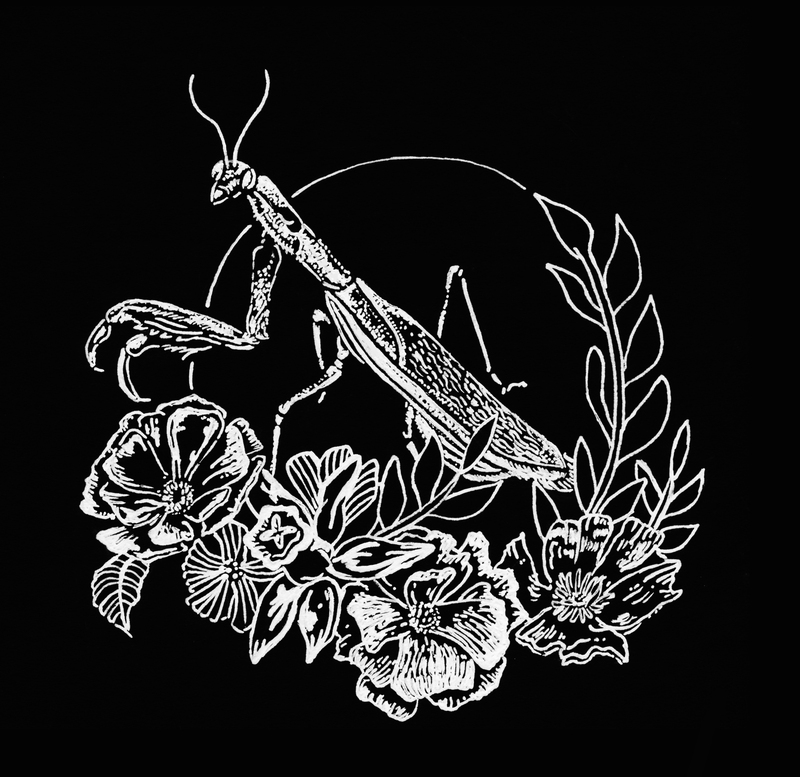 The majority of these are featured as part of Resilience, her latest exhibit, an immersive, interactive experience curated by BOJUart Gallery. The exhibit encircles the other three-quarters of the room in which she’s painting her mural. 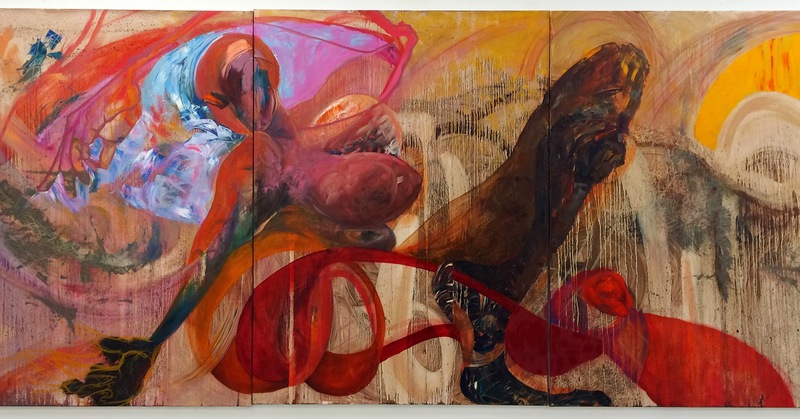 The works operate as mementos, whether to her departed loved ones or as chapters of her own mythology. Cathcart’s exhibit at BOJUart is an example of the growing arts initiative in Virginia Beach, part of the Virginia Beach Arts District’s effort to reclaim a resort town ailing from its own irrelevance. 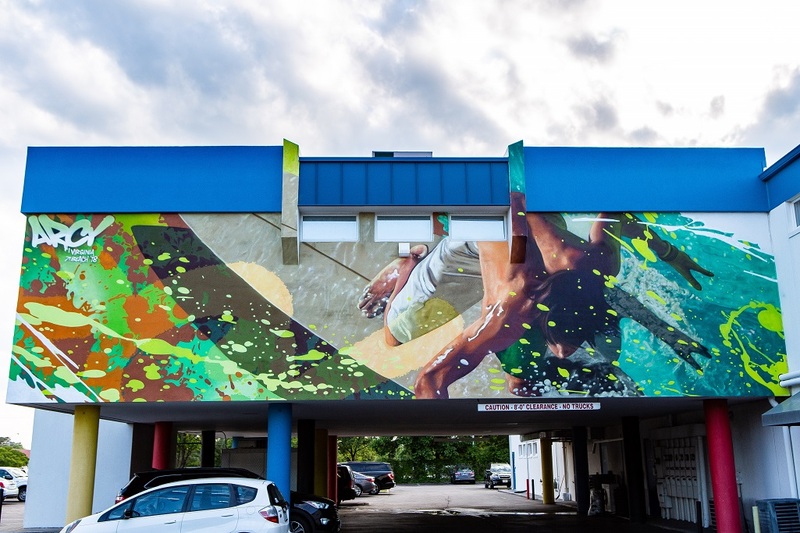 Though state lawmakers began offering tax incentives for Virginia art localities as early as 2009, it wasn’t until 2015 that an organization, The ViBe Creative District of Virginia Beach, was approved under an ordinance and officially tasked with roping in an ensemble. The ViBe is an official 501(c)(3), recognized by the IRS as a non-profit, with the ability to accept tax-deductible contributions and offer tax incentives to artists and entrepreneurs looking to rehabilitate buildings. In 2018, the city announced the ViBe Creative District Matching Grant Program, which provides grants to small, locally owned and operated businesses located within the district for building improvements and equipment. Kate Pittman, Executive Director of the ViBe Creative District nonprofit, is the linchpin of this great machine. She acts as liaison between the city’s public efforts to build the arts district, the private-sector small businesses, and local artists. She knows the right people and speaks in bureaucratic tongues. She knows well in advance which permits to apply for, she attends every First Fridays, shakes the hands, and always wears a smile. Pittman was hired in November 2016, after she’d spent 11 years working for Virginia MOCA overseeing museum operations. 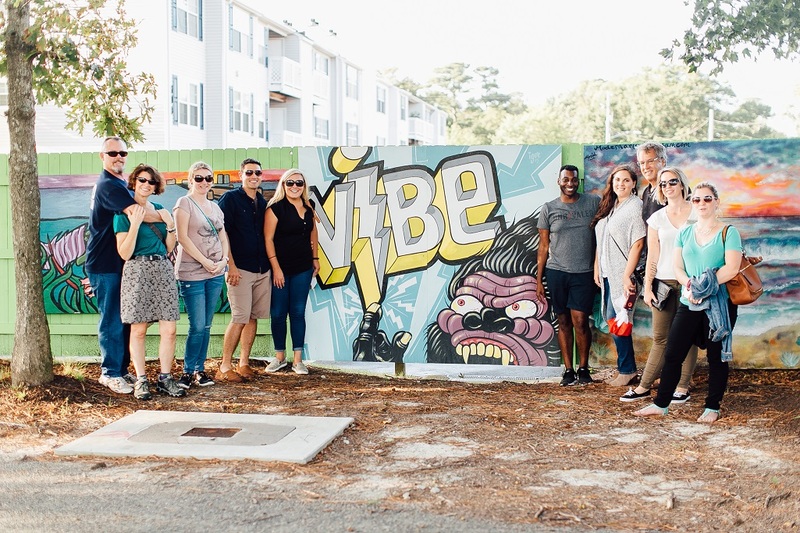 ViBe co-founders Andrew Fine, of The Runnymede Corporation, and Laura Wood Habr, of Croc’s 19th Street Bistro, worked on and off with the City of Virginia Beach’s Office of Cultural Affairs since 2013; researching, holding City stakeholder meetings, and engaging in grass roots efforts with local businesses to discuss the creation of an arts district. Since the ViBe’s inception, Pittman and involved artists have overseen the successful expansion of a district unmatched in the Hampton Roads area; an artistic sprawl of artists and creative businesses, including restaurants, galleries, museums, and roasteries, as well as murals and sidewalk art. Pittman stressed that the key to the ViBe Creative District’s success was to cater to art in a broad sense, and strive for it be self sufficient. This commitment shows in the broad spectrum of organizations they work with; on weekends in the right season, the Old Beach Farmers Market sets up at the corner of 19th and Cypress St. In other parts of the year, the Virginia Beach Flea Market sets up adjacent to convention center on the west end of 19th street. And of course, there’s always a strong connection to the local community — most of the restaurants are farm to table, and anything not grown feet away from the kitchens is usually purchased from local farm stands. Pittman says the district looks to continue its growth indefinitely. That said, continuing work on the city is visible, and far from complete. Streets along the fringe of the district are still littered with construction blocks, cracked roads, and caterpillar cranes. Stripped down malls, chipped-paint warehouses, and worn-down city streets still appear every other block or so. At 19 square blocks, the district still has the room for expansion. And that’s not even all — Pittman also mentioned a new brewery opening up on 18th Street in 2019, the arrival of the Virginia Beach Art Center and Artist’s Gallery on 17th Street, and numerous new commercial tenants coming to the district. “Private development will be big in 2019-2020,” she said. 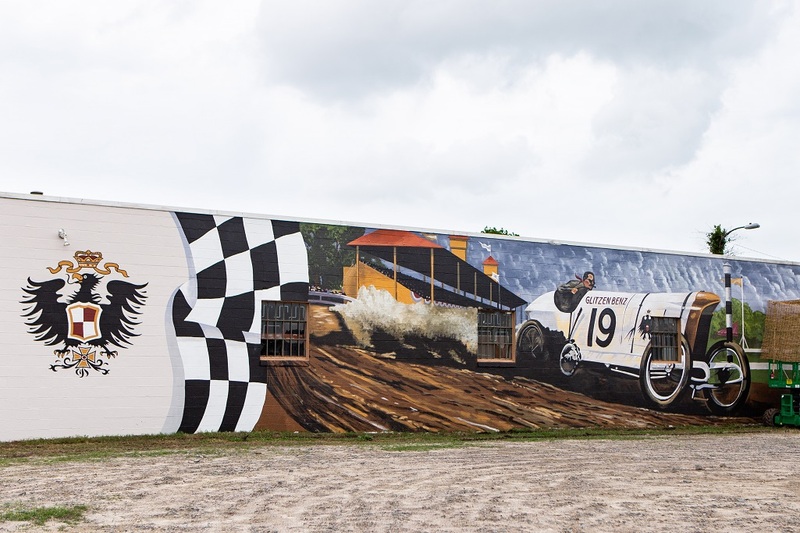 Mural by Igor (original artwork by American painter Peter Helck) at Abacus of Hampton Roads. Photograph by George Culver. Virginia Beach has always had the reputation of an up-and-coming resort town, but until recently, the city never seemed to see any real change come to fruition. It was a town of forgotten and misplaced projects. But large gains in tourism over recent years, with 2017 marking its sixth consecutive year of growth, have changed all that. However, some city officials are concerned over how much revenue a new arts district is able to bring to the city. With a new slate of leaders elected this past November, it remains to be seen whether the city’s new administration will have the same enthusiasm as previous ones. Former City Councilman Bobby Dyer took office as Virginia Beach’s new mayor after defeating Ben Davenport in the November election. In a November interview with the Virginian-Pilot, Dyer ensured he would “continue to honor [his] promise to build positive bridges with the City Council and my commitment to the public.” We reached out to Dyer’s office for comment, but no response has been sent over. In a corner of BOJUart Gallery’s main room, a poster is taped to the wall, with a wooden stand beneath. On the stand are bowls of cut-out birds and markers, shared so that guests to write in forms of loss and pain they experience. For Nico Cathcart, this part of the project is a way to connect with members of the local community, by sharing their experiences on a murmuration wall. With this communal aspect of the project, Cathcart hopes to make some broader meaning of the grief that accompanies her loss. 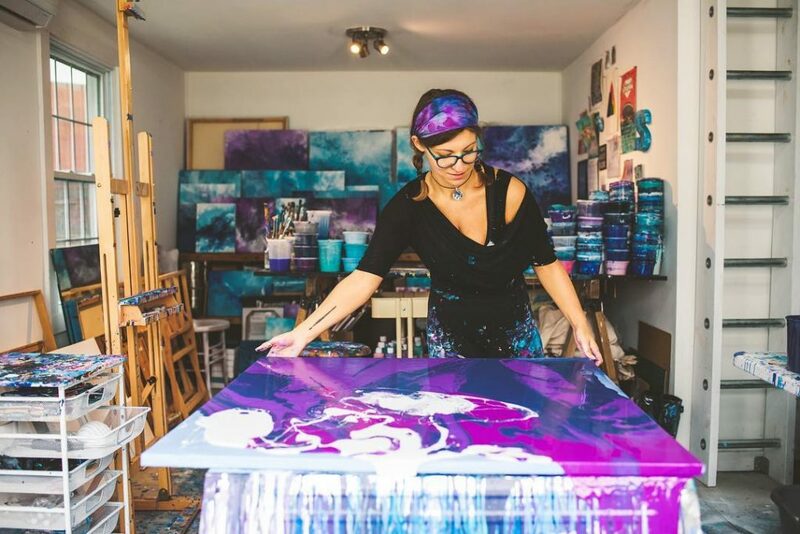 Cathcart will be working on her mural at BOJUart Gallery, located at 1703 Mediterranean Ave in Virginia Beach’s ViBe Creative District, throughout the month of January, with the grand finale taking place on Thursday, January 24 and Friday, January 25 from 6-9 PM. Once it is completed, interested enthusiasts will have the opportunity to purchase the complete mural, or one of the five 4’x5’ panels of which it is comprised, for either indoor or outdoor display. 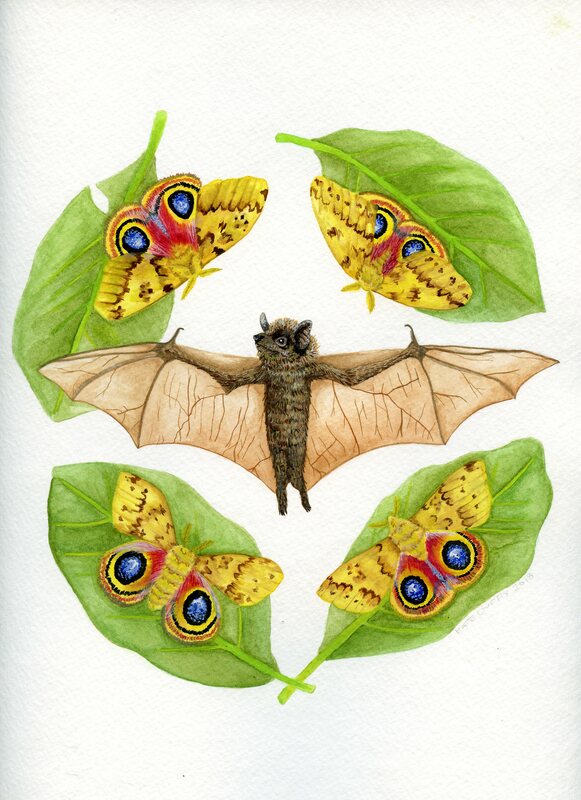 Check out the BOJUart Gallery for more information on Cathcart’s work and upcoming exhibits. For more information on the ViBe District, follow the link here. For Richmond, 2018 is a time for us to come together to understand not only the present we live in, but the ways in which the past has influenced us. The Virginia Museum Of History & Culture is doing just that with their most recent installation, Fresh Paint: Murals Inspired By The Story Of Virginia. Armed with their creativity, ten Virginia artists used an item from the museum’s collection as inspiration to create their murals. The result is ten complex and very different works of art. 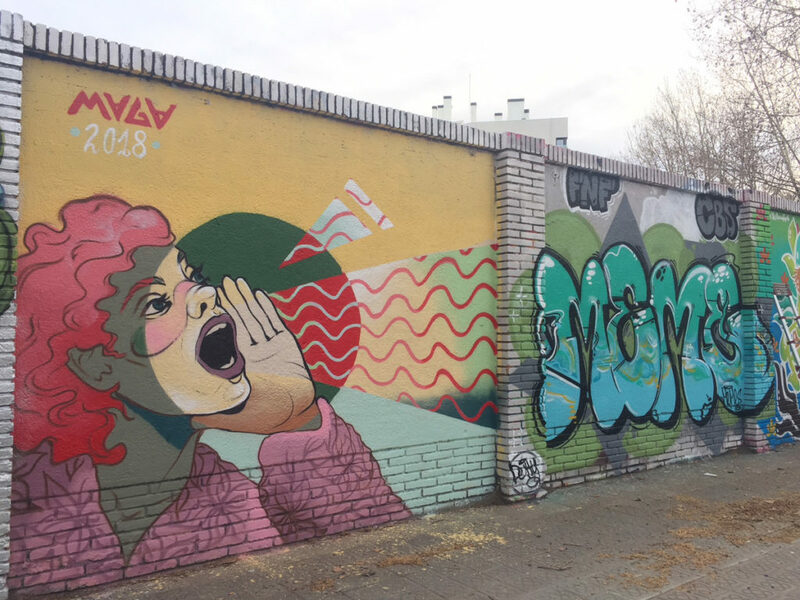 Speaking with several of the artists provided the opportunity to learn what their murals communicate. Nico Cathcart is a native of Toronto, Ontario, but is currently, in her own words, “adventuring in the southern wilds of Virginia.” We spoke briefly about the three women who played a key role in Virginia’s past, who are pictured in her mural: author and abolitionist Elizabeth Keckley, who fought for freedom; suffragist Adele Clark, who fought for the vote, to have a voice; and activist Casey Dokoupil, who fights for those who are currently disenfranchised. 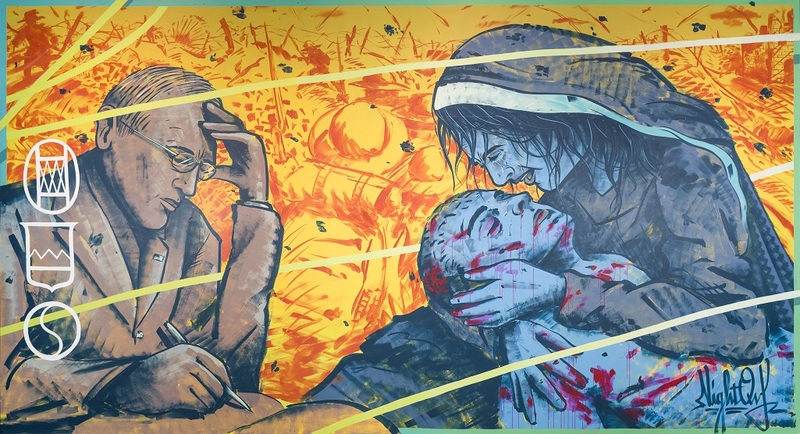 Muralist Mickael Broth is the founder of Welcoming Walls, a project which brings art to “the highways and gateways of Virginia.” His mural uses a powerful image of a mother mourning for her dead son in a wartorn landscape. His use of blue is reminiscent of Picasso’s blue phase, or Chet Baker’s melancholic jazz. According to Broth, he had ”connected with the internal and external struggles of war — in this case, World War One — to depict the way in which decisions on paper have real world ramifications.“ Losses suffered in war “ripple out throughout society,” Broth said. Modern-day renaissance man Noah Scalin explained his mural, The Readjusters, as “an attempt to show how much Virginia’s history hasn’t changed, both good and bad.” Scalin’s use of figures such as Janie Barret, who created a school in Hampton to help incarcerated African-American girls, and Samuel Tucker, who took part in the first civil rights sit-in in Virginia, demonstrate a response that modern-day activists may look to for inspiration. Scalin describes his mural as “a story about how even during our darkest times there have always been people who have risen up, spoken out, and worked tirelessly to make sure that this country truly lived up to the values it proclaims.” He compared today’s activists to the multiracial post-Civil War coalition known as the Readjuster Party, active in the 1870s following Reconstruction, which placed priority on African-American education. “[My mural is] a story of the ‘readjusters’ who exist today, who are fighting to tell a new story about our priorities as a state and a nation,” Scalin said. Austin Miles is a graduate of VCUarts. 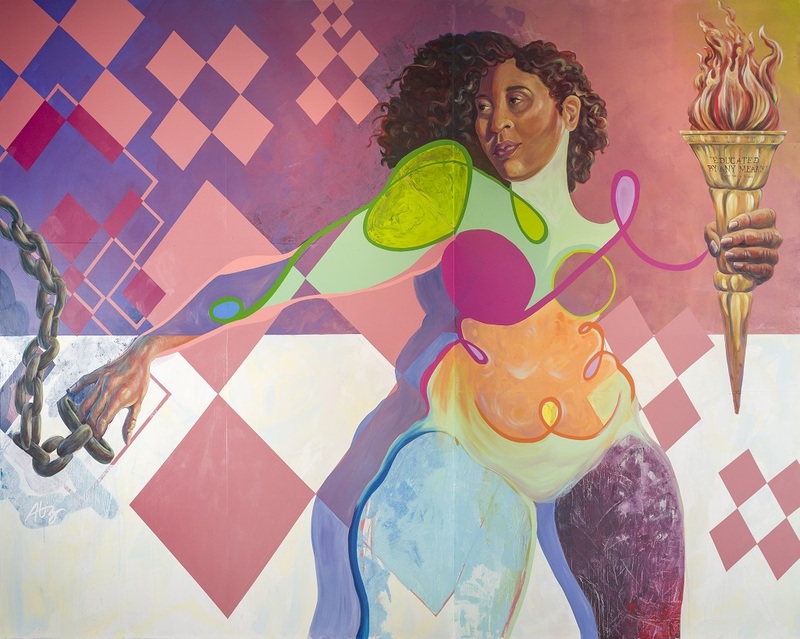 Her piece, By Any Means, tells the story of Black women utilizing education as a tool to free themselves and others from physical and mental enslavement. It is inspired by two American women of African descent: Mary Smith Peake, a free black woman in Hampton, VA who educated slaves and former slaves both before and after the Civil War; and Barbara Johns, a black Farmville, VA high school student who led walkouts at her school in the early 1950s to speak out about how separate education was NOT equal. “These were two Black women who stressed the importance of education and actively worked towards change,” said Miles. By Any Means features a woman moving in a forward motion, holding the bright burning “Torch of Knowledge” representing the passing of knowledge from one generation to the next, with an eager flame in her left hand, while she releases her right wrist from the shackles of slavery that once bound her. As the woman moves forward, she is guiding and lighting the way for others to follow. For us in the present, “this guiding light allows us to dig deeper into the psychological bondages that could be occurring within our present community,” said Miles. The installation features a number of other highlights, including Hamilton Glass’s powerful mural (pictured at top) depicting a pair of black hands bound by a rope with both an American flag and a Confederate battle flag in the background. 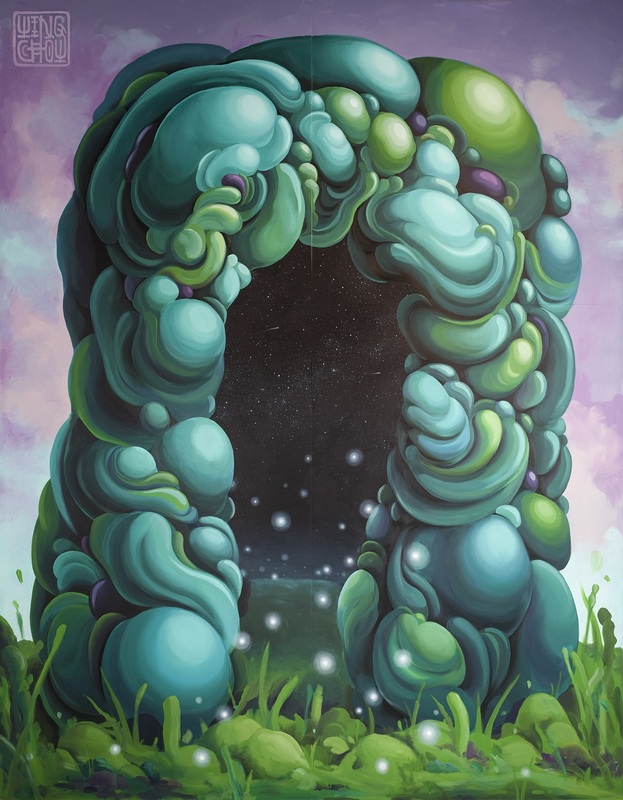 The most difficult mural to understand is that of Endeavor Gallery’s Wing Chow, whose mural seems to be a vegetal portal to another world; it arouses curiosity standing next to the other murals, and left me wondering what object from the museum inspired it. 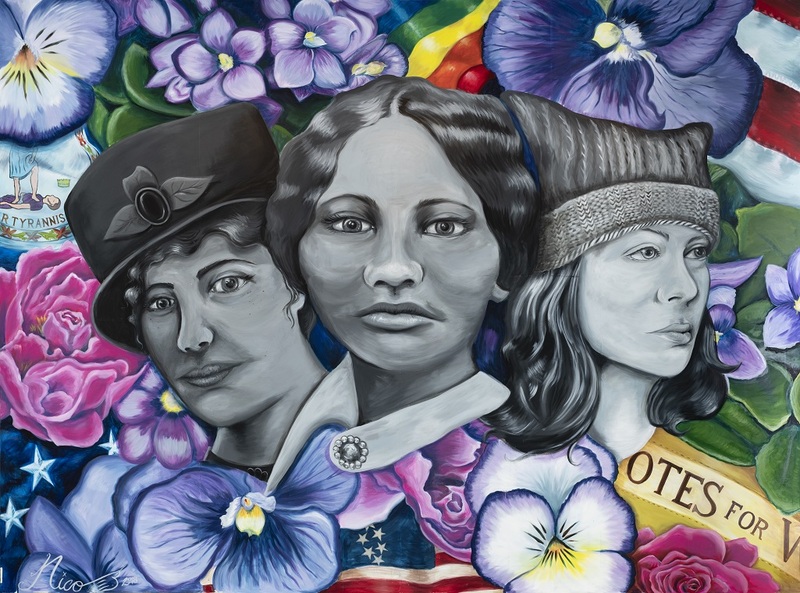 You can ponder all ten of the murals for yourself at the Virginia Museum Of History & Culture, located at 428 N. Blvd in the (you guessed it) Museum District, where they will be on exhibition until April 21st 2019.